This report covers the results of a survey of end users about their use of or interest in employing multiple displays for the purpose of gaining productivity in their work, or entertainment. This is the third such survey we’ve conducted, the first in 2002, then again in 2012. We found that the usage of multiple monitors has steadily increased over time, based on our survey data. In all our surveys, we asked the respondents to give us their estimate of actual, or expected improvement in productivity. In 2002, the average expectation of productivity improvement due to the use of multiple monitors was 46%. Productivity expectation in 2012 dropped a bit to 42%, and in our recent 2017 survey it stayed the same at 42% average expected productivity. Multiple displays give you a resolution multiplier: you simply cannot get the same resolution on one big screen as you can with two or more. Two monitors are often less than the price of one big one and provide more resolution. 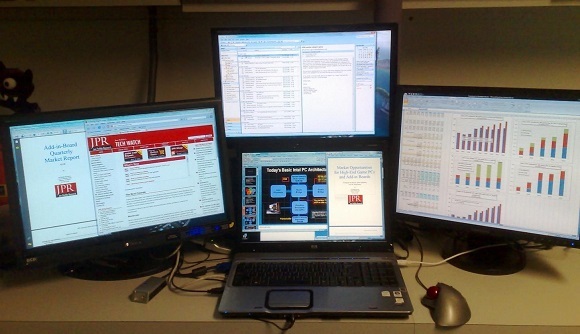 Unlike previous surveys, the respondents know their computers are capable of supporting multiple displays. The goal for this report was to identify the means of using multiple displays, some of the applications that benefit from multiple display use, and the productivity improvement, if any, realized from the use of multiple displays.